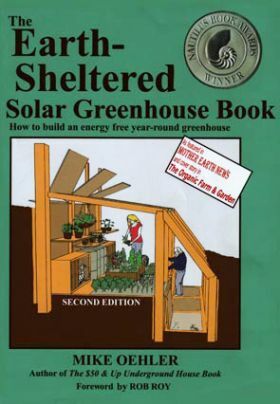 The Earth-Sheltered Solar Greenhouse Book is the first to promote the benefits of both passive solar energy and earth sheltering in greenhouse design. This combination results in greenhouses which need little to no additional heating. The captured sun's energy and that which is stored in the earth is enough for successful year round harvest. Gone are costly heating bills. Gone is the squander of non-renewable energy resources. This is because above-ground greenhouses get natural heat at night from only one side, the floor. They lose heat from the other five sides. The properly designed earth-sheltered greenhouse is naturally warmed at night -- and in the winter -- from five sides and loses heat from only one. The ratio is exactly reversed. This book has it all. It takes you step by step through the construction of an inexpensive greenhouse which may be built with either newly purchased or salvaged building materials for pennies on the dollar. It explains the author's unique Post/Shoring/Polyethylene construction methods and design techniques which Countryside Magazine called "Revolutionary... innovative and ingenious...a totally different concept." The book is both as simple and as amazingly ingenious as a paperclip. The book deals heavily with design so that you may custom build your own greenhouse perfect for your particular climate and needs. It tells you how to use gravity to warm your winter plants; how to effectively capture and store the sun's heat; how to make up for poor sunlight free of cost; how to automatically vent without power; how to choose the best glazing for your project; where to find free building materials; when to use heat tubes and when not to; how to use a root cellar in tandem with the greenhouse; where to use insulation with wonderful effect (and where to absolutely avoid it); how to deal with plant pests organically; what animals should be living in your greenhouse; and hundreds of more tips. The Earth-Sheltered Solar Greenhouse Book has 230 pages with nearly 200 illustrations, photos, diagrams, lists, charts and drawings. It contains all the information you need to free you from the pesticide, herbicide, fungicide, waxed, and E-coli laden, genetically modified and irradiated supermarket produce.